It was nice seeing so many of you at Let’s Celebrate. What a great way to celebrate the Grange and all that it stands for. *Charles Bierce’s picture of his dog was named Best in Show and will now go onto National Grange for judging. 3- Quinebaug Pomona with a skit named “The Grange Garden”. Mountain County has been asked to do their skit Monday night at Lecturers’ Conference. Monday night is when Connecticut puts on its’ program and a lot of people are needed. Please let me know if you can help. If you didn’t see Mountain Counties skit, this is a must see at the conference. Our Talent winners have been asked to perform Tuesday night at Lecturers’ Conference. This is the night we all dress up in orange and have a little friendly competition between the States. Knowing Connecticut Grangers I am sure you can make more noise, etc. than the other States. 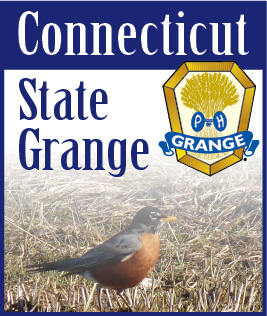 As we slow the pace of our Grange activities for the summer, don’t forget to check your Bluebook for all the other contests which we should be preparing in time to be judged for State Session. Hope to see you at Lecturers’ Conference and around the State.